Found myself back at Algonquin again, at Liam Doody's invitation, to judge the students' final pairing project in the wine and food matching course. Yeah, I know. I've got it so tough. Seriously though, three-and-a-half hours and 17 courses, with wines, is no small task. Loved the format this time around, having the chance to ask the students about their choices and dishes. 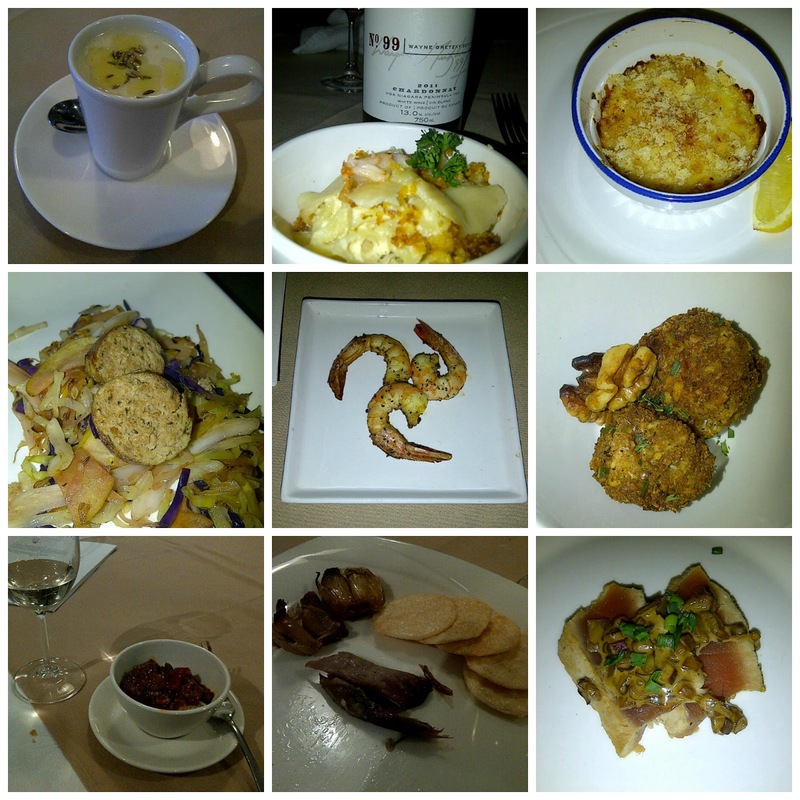 Some pairings were better than others, but the food was consistently ohmnomnom-my. Feast your eyes on this ... I'm still trying to digest. Domaine Vincent Car﻿ême Vouvray Brut (Loire, France; SAQ 11633591 $22.35; 13% abv) - Honey, floral and fruity nose; soft foam of bubbles, firm acid and a sweet finish. Good palate cleanser for fatty/greasy foods. Paired with deep-fried goat cheese nibbles. Tawse 2011 Gamay Noir (Niagara; V322545 $18.95; 12% abv) - I was advised to "taste with my eyes" for this pairing; the pink flesh of the seared ahi tuna was reflected in the ruby colour of the wine. Light, fruity, with a distinct earthiness to it. Lavender Ridge La Vigne (Luskville, Quebec) - Talk about a small world. When I was taking the wine and food class, I worked with Joanne Labadie, who is now the proprietor and winemaker at Lavender Ridge. This is a blend of frontenac, Ste-Croix and marquette grapes, aged in CHOA barrels (cherry-hickory-oak-ash) devised by Joanne and (here's more small-world-ness) put together by Pete Bradford of Prince Edward County's Carriage House Cooperage. Anyhoo, the wine gave up notes of woodsy smoke, followed by blueberry, blackberry and grilled meat on the palate, and a big, juicy finish. Paired with homemade duck sausages. No. 99 Wayne Gretzky Estates 2011 Chardonnay (Niagara; L63826 $13.95; 12.7% abv) - This was a real surprise for me. Huge aromas of pineapple, mango and caramel, with a medium body and not too much oak. This is a good chard for the ABC crowd. Paired with the lobster and double-smoked-bacon mac n' cheese, this was my favourite match of the night. Thanks for coming out Holly! Appreciate your exceptional palate fortitude and comments! Of course I mean "Thanks for coming out Bethany"...but I like Holly's blog too! Wish I could blame that on excessive product research, but I think I am just old-fashioned confused!